We just returned from our yearly retreat to Maine (surely la belle Province de la belle Province; Maine's schools would do well to teach French as a second language). Alas, I left the beach before I perused this link from Darko: Bookhampton's Hipster Lit Shelf by Macy Halford. When we were packing for the trip I seriously considered carting Roberto Bolaño's 2666 down to the sand and sea, but reached instead for a used and very weathered copy of Buffalo Girls by Larry McMurtry — a complete hipster fail, on my part, but also an effortless, emotionally rewarding read. Halford notes the absence of female authors, and offers as a correctional Flavorwire's Ultimate Hipster Reading List. I think the search for the female literary hipster could be aided by the additions of Sheila Heti and Miriam Toews. I don't like to go a week without posting, but I'll claim fatigue: between cracking the whip around the ever-present teens, and succumbing to the heat, I don't have much gumption for finishing the posts I've started. My wife returns from yet another work junket tonight. Adult conversation will resume, and possibly a few thoughts of modest sophistication. Thank you for your patience. Today is a big deal for Harry Potter fans. For me, not so much. Back when I had the opportunity to get in on the ground floor of Potter mania, I stalled. I bought the first book, but found the author's tone too disagreeable to get me past fifty pages. Years later, when our family faced a lengthy car trip across the Canadian prairie I reached in desperation for the audio recording. To my surprise, Jim Dale's robust performance of the book won me over. He relayed the narrative as if, in fact, its twists and turns were jolly surprises to him. The next few years promised several lengthy car trips, so I bought or borrowed the rest of the series, which we finished last summer. By then I was more than ready for it to be over. 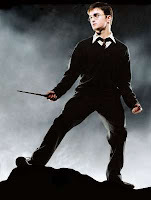 I'd grown weary of the Potter Plotline — begin with Squalid Episode in Harry's adoptive Muggle family; transport Harry to Hogwarts where he and his cohort sneak around to determine why Something Mysterious is happening; conclude with Perilous Quest and wrap it all up with Affirmational Epilogue — which Rowling took increasingly more time to lay out. 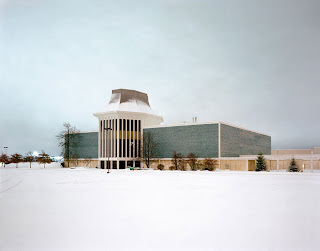 I still wanted to know where it was all leading, but I tuned out for vast stretches of Dale's performance, often cluing in belatedly after someone in the car gasped with surprise. Anyone who gets kids excited about reading, though, is someone to hold in high esteem, and J.K. Rowling more than qualifies. The Pottter Plotline worked, but more than that, the characters were compelling, especially to younger readers (again, as the characters grew to be all-too-convincing adolescents, my own interest thinned to near non-existence). But more than that, the magical environment these characters interacted in was entirely beguiling. Near the end of the series, as the tone of the adventures grew increasingly gloomy, I can recall a critic tangentially lamenting that he hoped there might still be room in the (then) forthcoming books for another Quidditch match or two. It strikes me that this remark cuts closest to what has made those books and movies so successful: a landscape of enchantment, imagination and play that entices the reader to speculate and roam further. A little Googling seems to bear this out. Potter fan-fic is booming, and there are all sorts of folks trying to mount a successful Harry Potter on-line RPG. RPGs . . . Harry Potter appeared just as Dungeons & Dragons was fading from suburban basements, and shortly before video games became persuasively immersive to both genders. Rowling so fabulously bridged that gap, I have to wonder: what might it look like to approach and weave together the next such nexus? 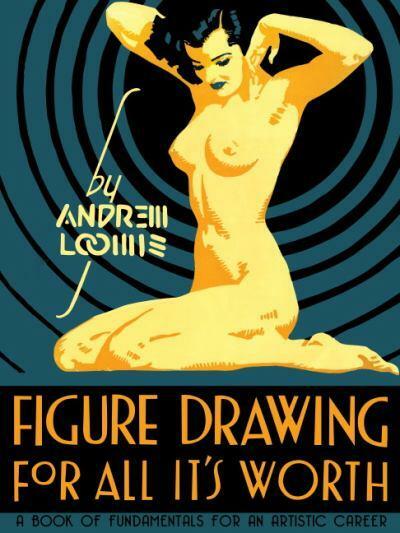 While contemplating the aesthetic pleasures and rigors of Andrew Loomis, I couldn't help reflecting on some of the drawing instruction books of my youth. Foremost among them, to a degree that couldn't possibly be exaggerated, was How To Draw Comics The Marvel Way by Stan Lee and John Buscema. 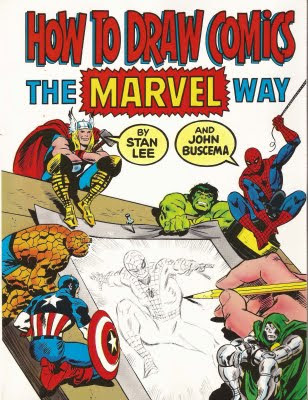 Even into early adulthood, this book was the final word on drawing anything. So how does it stack up in comparison to Loomis? None too shabbily, in fact. My weekly habit of purchasing a newspaper occasionally pays off musical dividends. Until I read J.D. Considine's enthusiastic rave for Red Hot + Rio 2, "Tropicália" was not a genre I was familiar with, nor had I heard of any of the "Red Hot" projects. I've little to add to Considine's appreciative appraisal, except that my own ear tends to incline toward the more eclectic tunes: "Ela" by Curumin, "Bat Macumba" by Os Mutantes and of Montreal, and "Aquele Abraço," a fabulous stew served up by Brazilian Girls, Forro in the Dark and Angelique Kidjo. And "Freak le Boom Boom" by Secousse and Marina Gasolina is so virulently infectious, it makes me a little crazy — in a good way (I think...). The curious should not delay: this is the ideal soundtrack for summer soirées on the patio. Mark Frauenfelder's post-slash-rave prompted me to get this recently republished instructional book by Andrew Loomis. I take a closer look, with pictures, over here. I chose Ernest Hemingway because he is deeply out of fashion, still over-admired by the literary boys-with-toys brigade, still shunned by women readers put off by the macho myth. His style is wrongly thought to be both simple and imitable; it is neither. His novels are better known than his stories, but it is in the latter that his genius shows fullest, and where his style works best. I deliberately didn't choose one of the famous stories, or anything to do with bullfighters, guns or Africa. “Homage to Switzerland” is a quiet, sly, funny story (Hemingway's wit is also undervalued) which also — rarely — is formally inventive. It has a three-part, overlapping structure, in which three Americans wait at different Swiss station cafés for the same train to take them back to Paris. Each man plays games of the sort a moneyed and therefore powerful expatriate is tempted to play with the nominally subservient locals — waitresses, porters, and a pedantic retired academic. But as the story develops, it's clear that social power and moral power are not on the same side. I hope “Homage to Switzerland” will make you forget the swaggering “Papa” Hemingway of myth, and hear instead the truthful artist. I got to wondering: is Hemingway out-of-fashion? Which circles would I have to travel in to know? I still love Hemingway — there are at least two-dozen short stories I’m very fond of (including “Homage”) and even a novel (The Sun Also Rises). I’m also familiar with Hemingway-induced dis-ease, particularly when it comes to The Sun Also Rises. The patent anti-Semitism cannot be overlooked; it’s a rotten impulse, to say the least, but Hemingway indulges it to deliberately position the Abrahamic religious-moral code as obsolete and vexatious. It’s the same code, of course, that provides the framework for Christianity and Islam, but it was the current norm to pick on the Jews — an easy and “acceptable” target. Hemingway sometimes had trouble resisting the easy target. So, yes: loving Hemingway does take effort. But love him I do. Recently, at the village thrift shop, I discovered (beneath a pile of Dan Browns) a copy of A Moveable Feast. It’s small enough to fit in my purse, a book made for travel and short exposure to the page. On Saturday as the women in my family bravely forged through the Ottawa crowds to catch a glimpse of Will and Kate, I sat in the shady patio of a café, swigged an iced coffee and lingered over the prose. Then there was the bad weather. It would come in one day when the fall was over. We would have to shut the windows in the night against the rain and the cold wind would strip the leaves from the trees in the Place Contrescarpe. The leaves lay sodden in the rain and the wind drove the rain against the big green auto-bus at the terminal and the Café des Amateurs was crowded and the windows misted over from the heat and the smoke inside. It was a sad, evilly run café where the drunkards of the quarter crowded together and I kept away from it because of the smell of dirty bodies and the sour smell of drunkenness. The men and women who frequented the Amateurs stayed drunk all of the time, or all of the time they could afford it, mostly on wine which they bought by the half-liter or liter. Many strangely named aperitifs were advertised, but few people could afford them except as a foundation to build their wine drunks on. The women drunkards were called poivrottes which meant female rummies. 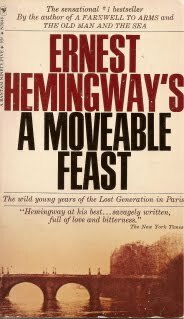 Hemingway situates the Café des Amateurs as a literal cesspool in the lowest aspect on the rue Cardinal Lemoine. He describes the effect the bad weather has on an already unfortunate scene, making subtle reference to his anxieties as a young man who is all but fleeing this dismal locale. The young Hemingway finally comes to “a good café that I knew on the Place St.-Michel. The older Hemingway, the rummy alcoholic fixated with medical photos of distended livers, now nearing the self-appointed end of his life, sees how desperately we fail to connect ourselves correctly to the narrative at hand. The story was writing itself and I was having a hard time keeping up with it. I ordered another rum St. James and I watched the girl whenever I looked up or when I sharpened the pencil with a pencil sharpener with the shavings curling into the saucer under my drink. Reading Hemingway isn’t difficult. In fact, it’s deceptively easy, which is one of his fundamental pleasures. There’s no shortage of writers who intimidate the reader, not just from reading the rest of their book, but also from approaching the blank page and pencil to commit to their own stories. But not Hemingway. Hemingway makes a reader feel like writing — a reader like Julian Barnes, certainly. And a reader like me.